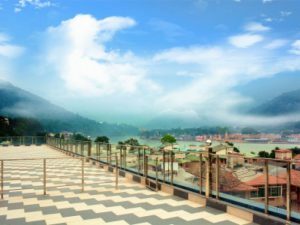 Rishikesh is a delight for the spiritually-minded. Join like-minded souls and dive deep in the holy vibrations of this town of yogis, ashrams, and saints. 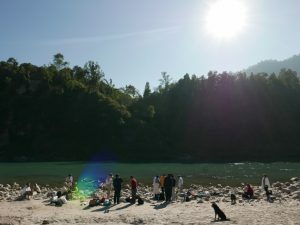 Nestled in the foothills of the Himalayas and surrounded by forest, Rishikesh is divided by the Ganga, which here is rushing and playful before it enters the plains. Hundreds of ashrams, large and small, surround Rishikesh. Life is centered around the river, as will be our visit. Divine Mother in the form of Ma Ganga will inspire us and be a reminder of the divine flow within. We’ll meditate in the homes, ashrams, and caves where Self-realised yogis of the past have lived. We’ll visit an inspired present-day spiritual teacher. And there’ll be free time to explore your own relationship with this fascinating and powerful place. Haridwar together. Daya Taylor will lead the group. Each morning we’ll energise and meditate on the ghats or in nearby ashrams. We’ll experience the Ganga arati at Parmarth Ashram. 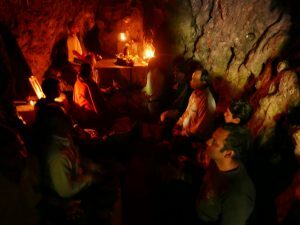 On a quiet stretch of river, we’ll meditate in the cave that was home to Sage Vashishta, then walk to a sandy beach for a purification ceremony. Downstream is the cave where Swami Kriyananda spent a month in seclusion. We’ll stay a two-minute walk from the river. Each morning we’ll energise and meditate on the ghats or in nearby ashrams. We’ll experience the Ganga arati at Parmarth Ashram. On a quiet stretch of river, we’ll meditate in the cave that was home to Sage Vashishta, then walk to a sandy beach for a purification ceremony. Downstream is the cave where Swami Kriyananda spent a month in seclusion. 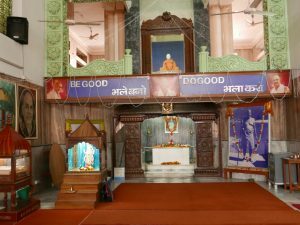 We’ll meditate next to the ashes of Lahiri Mahasaya at the ashram of Swami Keshabananda, at the Samadhi Mandirs of Anandamoyee Ma and Swami Sivananda, and the bhajan hall where “Hare Krishna, Hare Rama” has been chanted non-stop since 1942. We’ll also visit the Kriya Yoga Ashram of Swami Shankarananda. We’ll take time out of our busy lives to go deep in meditation, and share an inspiring, transformative time together. Indigo #818 departs Delhi 11:20 am, and arrives Dehradun 12:10 pm. Bus meets flight and takes us to hotel, where we have lunch. Later in afternoon we have an opening gathering, we walk along river, take a boat across and explore Swargashram area. Morning walk and Energization exercises, meditation at Swami Sivananda’s kutir. Later we’ll visit Divine Life Society. 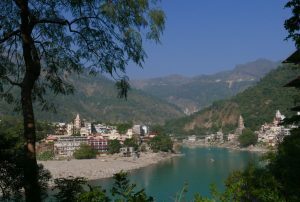 Then explore Lakshman Jhula area, optional shopping, and walking back along river path. Morning walk and Energization exercises along river, followed by meditation at Swami Sivananda’s kutir. Later we’ll have satsang with Mataji Vanamali Devi, and we can attend Ganga arati at Parmarth Ashram before dinner. Morning at Vashishta Guha for meditation, quiet time beside the river, optional dip. We plan to visit Kriya Yoga temple on return, and then have free time, returning to hotel for dinner. After breakfast we check out and drive to Haridwar to spend the morning at Anandamoyee Ma’s ashram, followed by lunch near the Ganga, then Swami Keshabananda’s ashram and Lahiri Mahasaya’s ashes. We drive to Dehradun airport. At 6:10 pm, Indigo #963 departs for Delhi. At 7:05 pm arrives Delhi. We’ll stay 4 nights, and take 2 meals a day, with premium rooms at Hotel Vasundhara Palace. Local transport is by bus, on foot, and by autorickshaw. Indigo #818 from Delhi reaches Dehradun 12:10pm, Friday 15 Feb.
Indigo #963 to Delhi departs Dehradun 6:10pm, Tuesday 19 Feb. Current cost is around Rs. 5500 round trip. A free bus will pick you up and drop you at Dehradun airport for these two flights. You may also choose to reach Vasundhara Palace Hotel on your own. There are a good number of stairs at several of our destinations. You can take them slowly but they can’t be avoided. We’ll also do a moderate amount of walking as a group. Double occupancy: Rs. 23,000 per person. Programme fee includes Dehradun airport transfers for the above two flights, group transportation within itinerary, lodging, two meals a day, and group tips. Not included are flights to/from Dehradun, four meals, snacks, water and other beverages, donations at ashrams, personal travel. 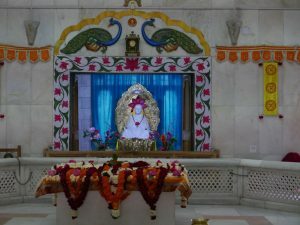 Pilgrimage begins at Dehradun airport before lunch on 15 February, and ends at Dehradun airport before dinner on 19 February.